It is April 1204, and Constantinople, the splendid capital of the Byzantine Empire, is being sacked and burned by the knights of the Fourth Crusade. 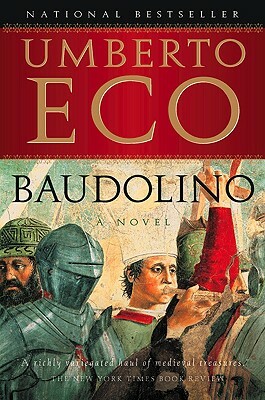 Amid the carnage and confusion, one Baudolino saves a historian and high court official from certain death at the hands of the crusading warriors and proceeds to tell his own fantastical story. Born a simple peasant in northern Italy, Baudolino has two major gifts-a talent for learning languages and a skill in telling lies. When still a boy he meets a foreign commander in the woods, charming him with his quick wit and lively mind. The commander-who proves to be Emperor Frederick Barbarossa-adopts Baudolino and sends him to the university in Paris, where he makes a number of fearless, adventurous friends. Spurred on by myths and their own reveries, this merry band sets out in search of Prester John, a legendary priest-king said to rule over a vast kingdom in the East-a phantasmagorical land of strange creatures with eyes on their shoulders and mouths on their stomachs, of eunuchs, unicorns, and lovely maidens. With dazzling digressions, outrageous tricks, extraordinary feeling, and vicarious reflections on our postmodern age, this is Eco the storyteller at his brilliant best.